Head lice is one of the most common reasons for school absence in the United States. Many schools in the U.S. have “no-nit” policies, meaning, if there is even one nit found on the head of a child, the school sends that child home. 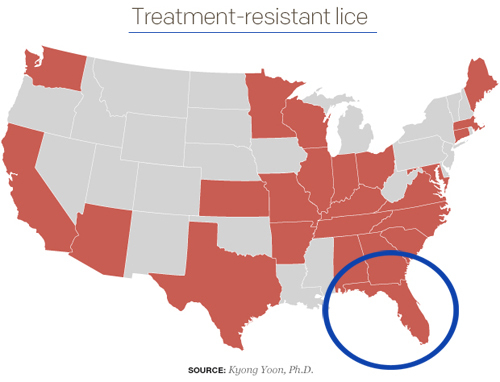 “Super Lice” have recently become a big subject for national news. It has been determined that lice have become resistant to the over-the-counter medications and many prescriptions that have been used for over 50 years. Those of us on the front line of the head lice situation have known for years of this resistance. If we liken it to growing ineffectiveness of antibiotics in certain human situations, it is not surprising that mutant super lice now infest our area. We at The Lice Boutique remove all lice and nits in a strand-by-strand method so Super Lice don’t stand a chance with us! Only 50% of the people with head lice actually experience an itching sensation. The other folks with lice may go as long as 14 days before they begin to itch. Itching is caused by the saliva that lice inject into the scalp before they begin to draw our blood out of the scalp when they feed. The saliva acts as an anti-coagulant, or “blood thinner,” to make it easier for the lice to feed. Only approximately half of the population is allergic to the saliva and therefore itch! Lice can camouflage themselves depending on their environment and can “play dead” for up to three hours at a time. These are two more head lice defenses that make lice hard to see and hard to kill. Many home remedies rely on suffocation as the method for killing lice, and the “play dead” lice game can fool a lot of hard working home-remedy moms. Additionally, we often see clients who have dyed their hair since finding lice, thinking that those chemicals will have killed the lice…all we find is newly hair colored lice thriving on the newly hair colored head! Lice facts from The Centers for Disease Control and Prevention has estimated that up to 12 million children in the U.S. are infested with head lice each year! We think that may be a conservative estimate. Since there is little or no reporting to health departments or other government agencies about head lice outbreaks, it is difficult at best to estimate how many cases of head lice actually happen each year in the United States.